Past meetings can be viewed online on Northshore School Districts website (View Board Meeting Materials page). Join Washington State PTA for Focus Day on Monday, February 11th and meet with our Northshore legislators in Olympia! Let's join together to show lawmakers that parents and students support excellence in education! Don't want to drive? 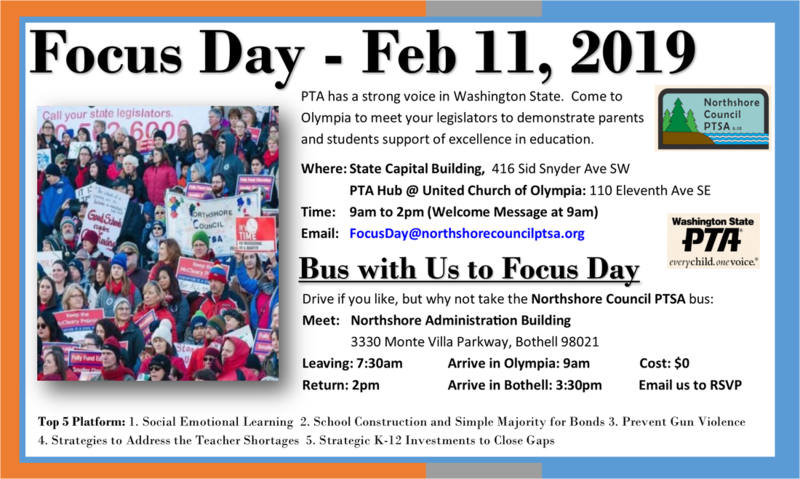 Once again, Northshore Council PTSA will be offering a "bus" for members who wish to attend Focus Day in Olympia on Monday, February 11th. We'll be leaving from the NSD Admin building at 7:30am with a planned return time of 3:30pm. This evening forum is open to everyone and designed to allow for two-way conversation in an informal setting. Attendees are invited to share their ideas about opportunities for Northshore and priorities for the District over the next 3-5 years. Northshore families and community members are invited to join Dr. Michelle Reid for an open chat. For more information about PTA Advocacy and Legislation in general, local representatives, 2016-2018 platform, and upcoming events for the year, please see our PTA Advocacy & Legislation page.